Unstable Lusaka Mayor Miles Sampa has confirmed that he refused to pay a bill of k700 after eating food at Roan and Stable restaurant in Lusaka. But PF Deputy Secretary General Mumbi Phiri has condemned Sampa’s behaviour and stressed that leaders should learn to humble themselves regardless of positions they hold. Sampa however hallucinated that those who think he failed to pay the K700 bill because he had no money should go to Chainama mental hospital for checkups. Speaking on Hot FM breakfast show Friday morning, Sampa claimed he had money to pay and could have paid even if the bill was K7,000 but he wanted to send a message which he has achieved. He said the food was good but he was not happy with the waiters who took over 15 minutes to get back to him. Sampa said he is going back to the same restaurant today and has invited all journalists with press cards to join him for lunch and that he will foot the bill. 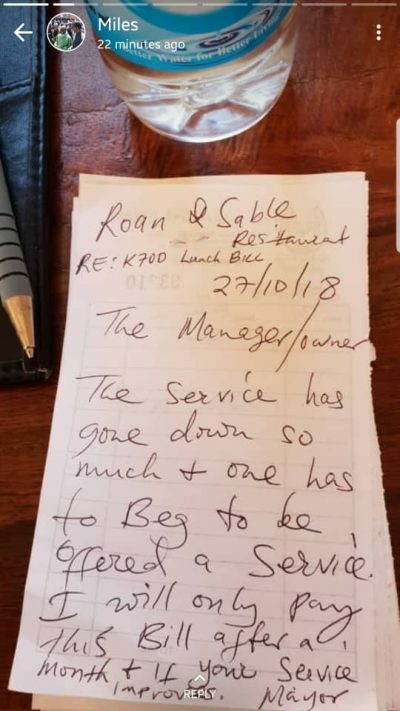 Sampa ate food at the restaurant but instead of just paying, he decided to write a memo to the manager giving conditions that he will only pay the bill of K700 after a month and if the service at the restaurant improves. He now says he will pay the K7oo bill with interest.